Tree kangaroos are macropods that live in trees in the mountainous rainforests of New Guinea, northeastern Queensland Australia, and a few islands nearby. Tree-kangaroos evolved from animals similar to modern kangaroos, and have strong hind legs and very long tails for balance, and stronger forelimbs with longer claws for climbing. On the ground, tree-kangaroos are slow and clumsy and hop awkwardly, but they are confident and agile in the trees. 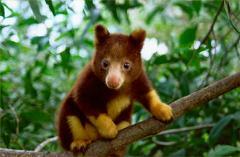 Almost all tree-kangaroos are considered endangered due to extensive hunting and habitat loss. Before the Australia forests turned into deserts, all of the kangaroos lived in trees. Scientists believe that eventually they all hopped down, and that at some point in history the tree kangaroo reverted backward in the family’s general evolution, climbing back into the trees, where it now spends most of its time. Tree-kangaroos love to eat leaves and fruit from trees and on the ground, but will also eat other food, including grain, eggs and even young birds.